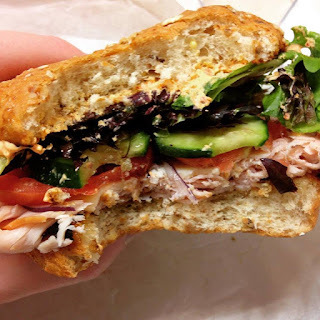 I’m not watching the Republican debate, so I’m going to make something that’s 100 times more enjoyable: a turkey sandwich review. Do you ever have those days where you find something and wonder how you ever missed it before? That was the Macy’s cafeteria for me. The building is right next to mine. I walk through it all the time, but I rarely go down to the basement. i usually just browse through the men’s clothing, not even realizing that there is a well-stocked sandwich counter just below. A co-worker told me about the counter last week and I put it on the list of places to try. I wasn’t going to get a sandwich this week, but happenstance led to a change of heart. I was at a conference in St. Paul in the morning, so I had to drive in afterwards. The normal escalator to my building was broken, so I had to go through Macy’s. That escalator brought me past a sign that said “Cafeteria.” I said to myself, “Well, that must be the place that’s gotten all the hullaballoo.” (Well, not much hullabaloo, just some office sandwich hullabaloo. I decided just to take a peek at it. It was everything I had been looking for. A small counter, with few lines, and good variety. It was cheap too, $4.50 for a half-pound sandwich. The first thing I noticed was the variety of bread. They had wheat rolls, white rolls, ciabatta, some other crusty bread, and pretzel rolls. All of them were toasted with butter. No other sandwich place is doing this right now. (I know because I’ve been to most of them.) They had a about a dozen spreads, including cream cheese. (Cream cheese is so hot right now… Actually I have no idea, I just wanted to say that.) I got the red pepper cream cheese on a wheat roll. I added turkey along with tomatoes, lettuce, onions, cucumber and pepperjack cheese. They had bunch of fancy sandwich cheese, including that blue-veiny kind. I can’t remember what it’s called. The whole thing came out to 6.86 (which was with tax.) The sandwich was about 7/10ths of a pound, so I thought it was a pretty good deal. I got back to my desk after passing my coworkers, who saw my big stupid grin and the sandwich in my hand and made the connection: I was in a good mood. Turns out, it WAS really good. The bread quarterbacked the sandwich well. It gave it a toasty taste. The veggies were all crunchy and the turkey was fresh, not slimy. I would have liked a little more spice from the spread, but overall I’d give it a 4 out of 5. Sometimes those little ventures off the beaten path are so, so worth it.